In contrast to other works in this exhibition, this painting belongs to the 19th-century Company period, when artists trained in the Mughal tradition now sought patronage with the new British rulers, modifying their art to accord with European tastes. In this sensitive portrait, a Bengal dancing girl stands on a durree spread on the balustraded terrace of a British mansion in Calcutta. She raises her hennaed hand as if in a dance gesture. 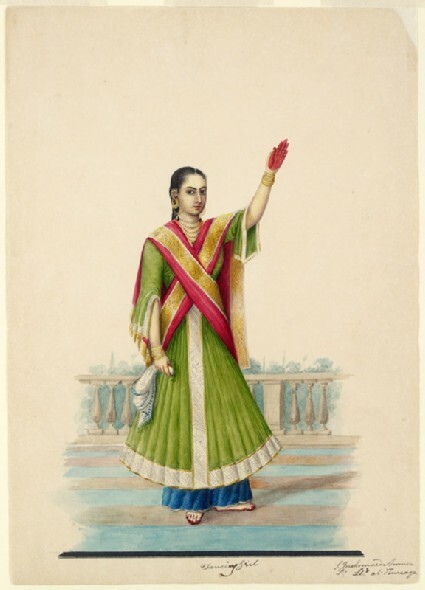 Nautches or dance performances in the Mughal kathak style had become a popular spectacle among British officials in India by the late 18th century. An English inscription ascribes this work to the well-known artist Shaikh Muhammad Amir of Kurraya (a suburb of Calcutta).